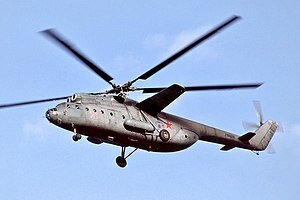 Mil Mi-6 (Russian: Мил Ми-6; NATO reporting name: Hook) was a Soviet heavy transport helicopter designed by Mil. ↑ Gordon, Yefim; Dimitriy and Sergey Komissarov (2005). Mil's heavylift helicopters : Mi-6, Mi-10, V-12 and Mi-26. Red Star. 22 (2nd ed.). Hinckley: Midland Publishing. ISBN 1-85780-206-3. ↑ "vectorsite.net". www1.vectorsite.net. Retrieved 9 February 2019. This page was last changed on 18 February 2019, at 15:25.